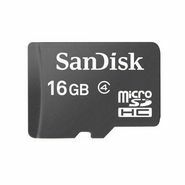 SanDisk 16gb Micro SDHC Mobile Memory Card is a high capacity memory card which is USB compatible and has data transfer rate at Hi-Speed USB 2.0 version. There is no necessary to use any other card adapters. This 16GB memory card from SanDisk is highly compatible with operating systems like Windows Vista, 2000 and XP along with Mac OS X. This has been built to withstand any shock or rather easily breakage is forestalled.